Access 90th FWRC Workshop Materials! Log into the Members Only section of this page. 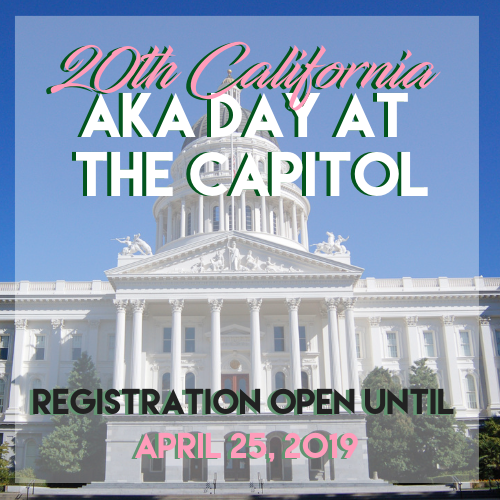 20th Annual California AKA Day at the Capitol, “Amplifying our Voices for Safe and Healthy Communities” on May 5-6, 2019. We are excited to join together in our state capitol for the 20th consecutive year, for the purpose of raising our voice in the continued fight for social justice and human rights. Our legislative sponsors, the members of the California Legislative Black Caucus, and their staff are eagerly looking forward to our annual visit. Subscribe to the Far Western Region YouTube Channel!! Subscribe to the Far Western Region YouTube channel! See our STEM activity from the 89th Far Western Regional Conference, 2018 State of the Union and profiles for our Public Meeting Honorees.